Blogging is my way of shedding light on topics you know. Are you managing or do you own a restaurant(s), cafe, brewery, bars, a caterer or another food biz? If so you’re looking for answers. These help you get closer. As an owner of a food related business, you have people and responsibility pulling you in different directions. So, if bringing one more task to your attention is not what you want to read, stop now, come back later...Know that its not good to ignore the appearance of your business. It's easy to tell yourself “no one notices” or you don't care, or even “it doesn't really matter”, or wish them away. But it does make a difference. Honestly, the customers see what is undone, incomplete, needing attention. These incomplete projects do not make you look good. In the next week, if you have the nerve, just allow yourself to address one of them at a time. Arn't you tired of the struggle to attract and/or find good employees to your cafe, brewery, restaurant or catering company? This problem is real. I'm not even going to belabor that point. It's just gonna make us sad! Here's an outline that might help you reset your hiring habits and procedures, and give you better results. Ready, set, go! Restaurant owners don't have time to wander around dreamily imagining good social media. You don't know everything about social media, either. BUT, you need clarity, instruction and examples. Zeroing in on what makes good content on social media--that's what you need. So this month I am focusing on Instagram. I'm going to let my research speak for itself. Here are good example of amazing social media from a restaurant. Here's what I learned. Are you a skeptic when it comes to YELP? As owners of restaurants, we are. This topic is visceral, real, and even unpleasant. I’m actually conflicted: as a restaurant person, I too can get annoyed by YELP. As a customer, let me admit my truth, I find the app useful at times (more on this below!). We’ve all be burned by customers spouting off what they think. Our response at that moment is to say, “they have no idea what was really going on!” But we all know a response must be formed. I recently had a conversation with a YELP team member, and I’ll share what I learned because it’s useful to the community of owners. I’ll dig into the pros and cons, and then concluded with my takeaway. Branding for restaurant is, fundamentally, the five senses. I was asked to teach a small class of grad students who are trying to develop their soon-to-be businesses. The professor needed tangible examples of how to build a brand. She asked me to show them how restaurants, and the five senses fit together to form a brand. Fitting those senses together can be incredibly effective, since restaurants have a look and a feel. The interior creates that, and marketing reflects that. What does your guests smell, see, taste, hear and touch when they come into your restaurant. It may seem strange to defer to the five senses to understand what your place is to your guests, but if you take the time to make sure the senses match what you intended your restaurant to be, you will be pleased with the results. When you take an active approach of each sense, you discover that this will help guide your decisions. Today’s blog is focused on the quality of your food and the product you serve in your restaurant. The best tool to manage change in your restaurant is The Six Pillars of Success. I've discovered that taking a little time to study each pillar helps owners focus. Hopefully it is helpful to you. It'll stop your from getting overwhelmed. With reflection comes improvement. It works for the team and guests. The Six Pillars, briefly, are strategy, financial stability, operations, product, distribution, and customer experience. This blogpost is centered on product. Technology can support a restaurant, bar or cafe. 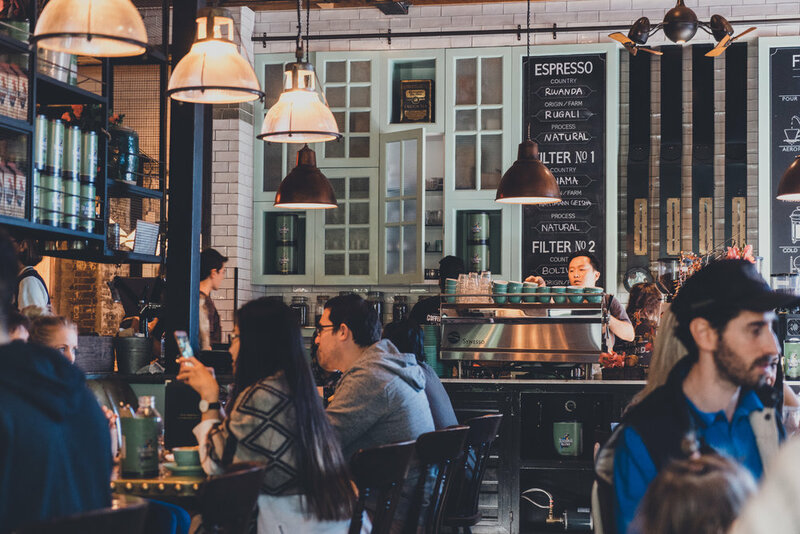 Find the systems that work well for your three most important technology centers: POS, an accounting system, BOH restaurant management software. This month I've found myself thinking, "the procedures in the restaurant arn't current!" Restaurants, cafes and breweries are ever changing, and hopefully ever growing. Adding technology is part of those changes. Technology and computerized systems reflect what staff and management need. If a technological solution and system is working, then every day feels less chaotic. More like a train moving down the track. Ultimately if your not making money in your restaurant, chances are there is little to no structure. You're reading this thinking, "Oh, yah, we need to improve!" Here are some solid computerized systems your business needs to stay current. When you've been in business a while you get those pangs, "I should be posting once a day", "I should know what to say and what to hashtag". Panicking never helps. Deciding a strategy does help. Simply put, you can write down the answers to WHO WHAT WHERE WHEN AND WHY, and you'll be able to decide how to spread it out on a calendar. Here goes, answer these questions for your business. Marisa Dobson is guest blogger for this month's post on PR. She is the founder & principal of Scintillate, a publicity and marketing consultancy that specializes in food & lifestyle clients. For over ten years, she's worked with professional creatives to turn their passions into passion projects. Visit www.marisadobson.com or follow her on Instagram: @marisa_dobson. When it comes to restaurant culture, owners, guests and staff want to know, "what's the secret ingredient" in Mama's cooking; or in ramen. Restaurant owners ask specifically for the secret ingredient in the CULTURE of a place”. This is the question I posed of Erin Moran. She is Chief Culture Officer at Union Square Hospitality Group--Danny Meyers' company. We had a short interview on company culture. Here are the nuggets from our conversation.